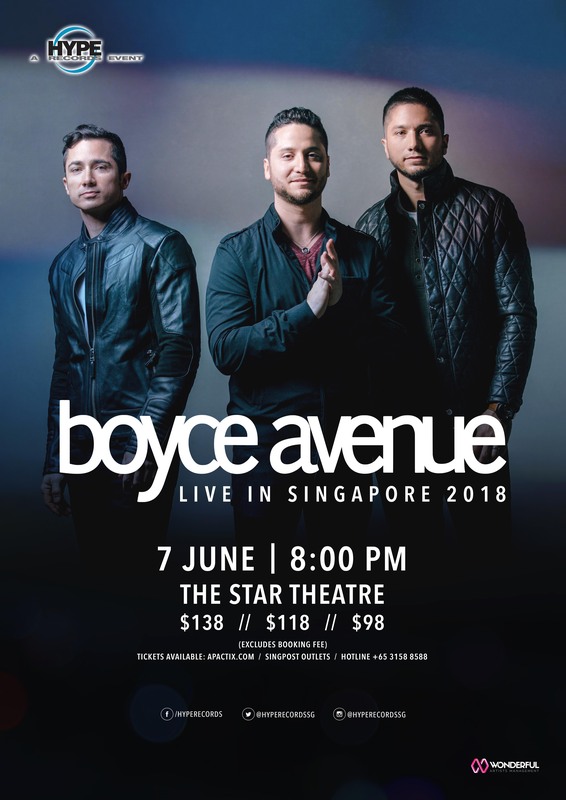 Hype Records is delighted to announce the return of Boyce Avenue Live in Singapore 2018 for an intimate show at The Star Theatre this 7 June 2018! Formed in 2004, Florida-based band Boyce Avenue, comprising of the three Manzano brothers — Alejandro (lead vocals, guitar, piano), Fabian (guitar, vocals), and Daniel (bass, percussion, vocals), rose to fame when the world heard and resonated with their soulful original songs and distinctive covers renditions on YouTube. Their strong acoustic roots and melodic rock vocals had not only won them legions of fans around the world, but has also enabled the brothers to forge a lasting and passionate digital fan base, with over 3 million Facebook likes and a half million Twitter followers. With three original music albums and nineteen cover Eps under its belt, Boyce Avenue has successfully amassed more than 3.8 billion views and over 10.9 million subscribers on YouTube to date and growing, making them the most viewed independent band worldwide. Boyce Avenue, with sold-out performances across the globe, has racked in excess of 10 million songs and 1 billion streams, and has had the privilege of touring the world several times, selling more than 600,000 tickets in over 30 countries, including, most recently, a sold out headline show at the legendary Royal Albert Hall in London, in November 2017. Last performed here three years ago to overwhelming response, the trio returns to serenade Singapore with a repertoire of original songs as well as popular cover hits including “Be Somebody”, “One Life”, “Yellow”, “Find Me” in this highly-anticipated concert!